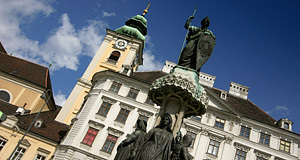 Austria has been a thoroughly Catholic nation for centuries. As such, ever since the Middle Ages monastic life was crucial for centralising intellectual, cultural and political endeavours. Many monasteries were maintained continuously for centuries. Austria′s oldest monastery, St. Peter in Salzburg, was founded in the 8th century and has been active ever since. Over the course of such a long history, many monastic institutions accumulated wealth, power and privileges. If such an institution gained the legal status of an entity with a council and extensive properties (such as agricultural land, houses, churches, parish taxes), it became a "Stift". Today, the Stifte of Austria are famous for their architectural and cultural heritage. They attract thousands of visitors every year and make a great theme for a tour across Austria. Stifts were maintained by the "old orders": Benedictine, Cistercians, Augustinians and Premonstratensians. In the Middle Ages, they had a close alliance with secular power; it was monasteries from where Christianity spread to the Awarian and Magyar tribes, where people looked for shelter in times of war, where important centres of pilgrimage - and thereby traffic, trade and craftsmanship - developed. By the time that reformation kicked in around 1500, the wealth and power of many monasteries had grown dramatically. The "old orders", most importantly the Benedictine and Cistercian monasteries, were power hubs and on the side of "the man". It is their possessions that we call a "Stift" today. Wealth and power had lowered the moral standards, the strict rule of St. Benedict, that had regulated behaviours and customs in monastic communities for centuries, was widely ignored. This made the "old orders" easy targets for reformist movements: The Franciscan monks and other - more radical - orders standing up, demanding a rule of poverty for monks and nuns stirred up the medieval Europe especially in the 15th century. In 1418, the "Melk Reform" from the Lower Austrian abbey of Melk tried to re-align the monasteries of Austria, Bavaria and Swabia to their original ideals. Later on., evangelical reformers criticised the circumstances under which monastic life was lived. People like Martin Luther doubted or even rejected the concept of monasteries in principle. During these decades, the "Stifte" lost their Medieval role as centres of intellectual, cultural and political power. Fewer people were willing to become monks and nuns and entire monasteries faced decreasing numbers of novices. Austria turned almost entirely protestant in the early 16th century. The Habsburgs were not delighted about this. The campaigns that followed to expel Protestants and make Austria Catholic again are what we call the age of the "counter-reformation" today. For this purpose, the monarchs of Austria relied once again on the support of their medieval allies - the monasteries. In the 17th century, they were equipped with large financial and political support, controlled education, arts and the public life in Austria. Much money was invested into re-furbishments and the vast majority of all abbeys got a Baroque face: New churches, parks, altars, cloisters were built - religious palaces with a distinct Austrian-Bavarian-Bohemian character, unrivalled in size and splendour. With Austria′s rise to a global power with incredible wealth, the orders could afford to build excessively in the 17th and 18th century. Abbots were often treated like high nobility of the rank of princes ("Fürst"), their possessions of land considered to be more or less independent. Under the rule of Emperor Joseph II, things changed once again: his reforms in the days of enlightenment in the years between 1782 and 1790 aimed to abolish all monasteries with a purely theological orientation. For centuries, monasteries were primarily religious institutions. Suddenly, the "Stifte" lost all their possessions unless they did something "useful", such as maintaining hospitals, schools or parish work. Hundreds of monasteries lost part of their power and wealth, but public structures (such as schooling) remained connected with the monastic world within Austria. This tradition can still be seen in today′s politics and the importance of the abbeys and nunneries within the Catholic church of Austria. Today, the "old orders" run 36 active "Stifte". Of these, 16 are Benedictine monasteries, 9 Cistercian, one Trappist (reformed Cistercian), six Augustinian and three Premonstratensian. From the tourist′s point of view, all of these "Stifte" are interesting - beyond that, however, there are some more, abandoned abbeys and nunneries with buildings and possessions that make them interesting destinations. Taking these into account, there are approximately 50 Stifte in Austria that are well-worth a visit. Surely you can′t see all of them (unless you make them a "theme" for touring Austria), but every visitor that wants to see much of Austria should see at least a few. If you tour Austria by car and see that you are close to any of the monasteries that I will describe in the separate articles for each province, do take the effort and go there - each and every one of them is worth a visit. The ultimate highlights are Nonnberg (the oldest nunnery in the World) and St. Peter (the oldest Catholic abbey outside of Italy) in Salzburg; Kremsmünster, Wilhering and St. Florian in Upper Austria, Melk, Göttweig, Zwettl, Altenburg and Klosterneuburg in Lower Austria and Admont in Styria. Nevertheless, it′s often the little gems off the beaten track that offer the most rewarding experiences. The region that got the most of the "Stifte" is around the Danube, the medieval core of Austria: Upper and Lower Austria, north of the Alps. back to "tours & trips"